Wife and I decided to have some fun! 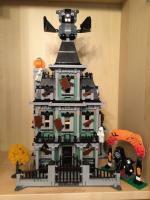 Added the new Halloween Bat 40090 to Haunted House 10228. I love tbe Haunted House. Need to check mine as ot has been a while now..:-).